Glen Libby, president of Mid-Coast Fisherman's Co-op in Port Clyd, with freshly packaged Maine shrimp. The 12-member co-op started a small processing facility and now process about 12 percent of their own and other fisherman's catch. "We only started in June of 2009 and there is interest in locally caught and processed seafood. We are still small but hope to expand as we can," Libby said. Pandalus borealis sounds like something fantastical, like a figure from mythology or a legendary creature. It’s actually the scientific name for a little pink crustacean that fishermen pluck by the ton from the coldest parts of the ocean each winter — the tiny, briny, deliciously sweet wild Maine shrimp. Whether you’re buying it from a seafood truck on the side of the road, from a fish market, a food co-op or from a supermarket, you’re buying a delectable, sustainable source of protein that was caught, processed and distributed entirely by Mainers. Some of those Mainers are the folks at Port Clyde Fresh Catch in Port Clyde who supply restaurants, casual shoppers and members of its co-op with pounds of shrimp meat each week — as well as fish, lobster, crab, scallops and other ocean treats. The shrimp season starts Dec. 1 and continues through April 15, though a strong catch could force it to close early, as it did last year when the catch exceeded the limit by 60 metric tons. 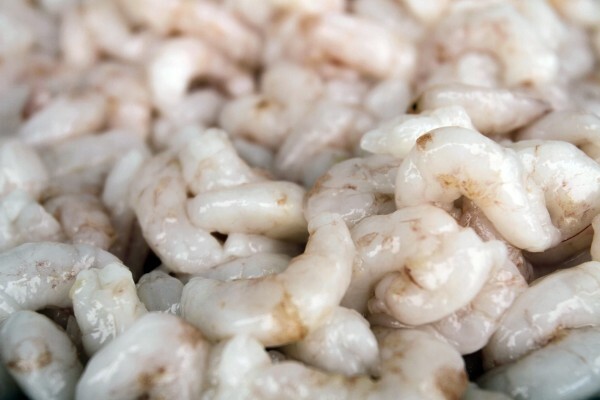 Last year, PCFC began processing seafood as well as selling it whole, meaning that they can sell shelled, deveined shrimp to the public, as well as whole shrimp. Messy, yes, but if you are a smart shopper it can be cost-effective. One pound of whole shrimp can sell for anywhere from $1.50 to $3 a pound, and yields about a half-pound or slightly more of shrimp meat. Compare that to a pound of shrimp meat that costs either $5 or $6 a pound. 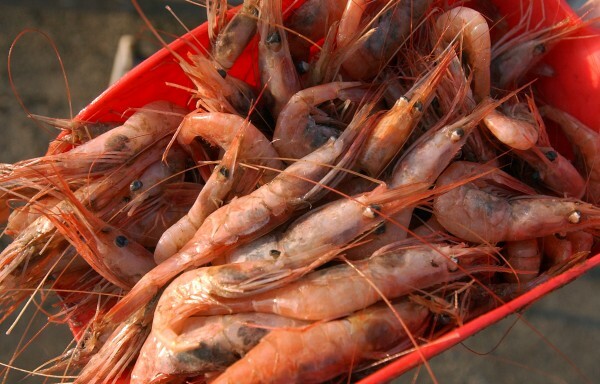 The amount of shrimp caught in recent years means that some of the bounty goes out of state. 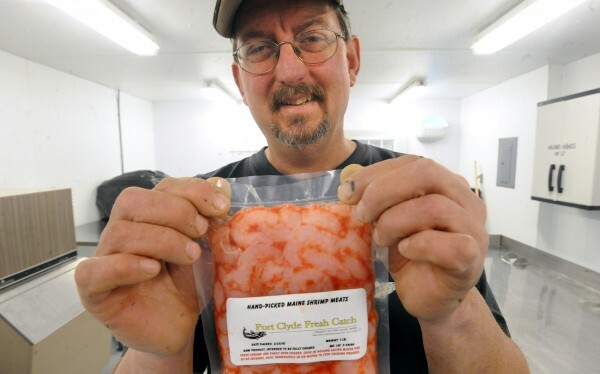 Last year, PCFC began selling shrimp in Rhode Island and New York. Once a month, market-goers at the New Amsterdam Market in Manhattan can buy Maine seafood from PCFC, though the market season doesn’t start again until March. Aside from that, wild shrimp are still, in many ways, a local delicacy for Mainers. Restaurants such as Suzuki Sushi Bar in Rockland, Paolina’s Way in Camden and Cleonice in Ellsworth all use Maine shrimp in menu items. Kerry Altiero of Cafe Miranda in Rockland loves Maine shrimp for a variety of reasons — but he’s careful to make sure they are cooked in way that leaves them neither under- nor overcooked. Though Altiero says one of the best ways to cook them is the age-old Maine favorite method of breading and deep-frying, he likes poaching or searing shrimp just as much. Heat a wok without the oil on high heat until it is smoking hot. Quickly add the oil and then the shrimp. Do not stir as you want to brown the shells. It ought to smell great, but watch for flare-ups as the moisture comes out of the shrimp. Place the vegetables around the edges so they will start to cook as well. When they begin to brown, toss them. When the vegetables and shrimp looks cooked (onions browned or at least translucent) toss in the vinegar to glaze the shrimp. Turn out the mixture to a warm platter. Serve as a peel and eat warm, or at room temperature, with a garlic and lemon aioli — mayonnaise, with garlic and lemon added to taste. Heat garlic and olive oil in large skillet and cook over low heat until soft. Add tomatoes, hot pepper and 1 cup water and bring to simmer. Cook for 3-4 minutes or until tomatoes have softened. Put shrimp in skillet, sprinkle with pepper and cover. Cook on low for few minutes until shrimp is opaque. Remove shrimp to a deep platter using a slotted spoon and top with the pan juices, sprinkle with parsley and drizzle with the remaining olive oil. Serve with toasted bread. Or place bread in flat soup plates and divide shrimp evenly between bowls. Heat oil in large skillet on medium-high heat. Quickly add garlic, ginger, curry paste and lime to oil and stir quickly to combine into bubbling paste. Add green beans, carrots and onions and saute. When onions begin to soften, reduce heat and add coconut milk. Simmer for 7-10 minutes, stirring every few minutes to evenly cook vegetables and keep film from forming on coconut milk. When carrots and beans are tender, add shrimp and cook for no more than three minutes, so shrimp are cooked but still soft. Serve over basmati or jasmine rice, with lime wedges and fresh basil for garnish. Lay out shrimp in a large glass dish. Pour lime and lemon juice evenly over shrimp, then refrigerate for 3 hours. The citric acid in the juice breaks down the protein in the shrimp, causing it to “cook.” Remove from fridge after three hours, toss shrimp and juice with remaining ingredients, and refrigerate for another hour. Serve with chopped avocado and tortilla chips.